Sample Ballots for May 2019 Primary are here. Locate your precinct below and click to see the sample ballot. If you don’t know your precinct number, use the PA Polling Place Search here. 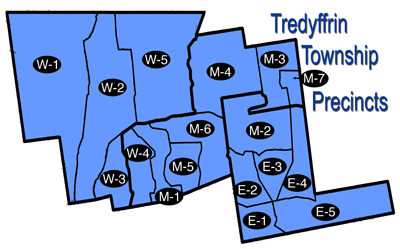 Also, click here for a high-resolution map, from Chester County government, of Tredyffrin precinct boundaries and voting locations. Zoom in for enlarged view and street-level details. Finally, if you have moved and haven’t changed your registration or you have other questions about voting, you can find answers to most questions through the Pennsylvania Voter Info Page..